Pleased to say that I've walked the M62 - and here's the book of the journey. Available from Lulu at £8.49; details/order here. In your section Lindley to Scammonden, the idea for the reservoir came not from alocal farmer but from the head of Huddersfield Corporation Water Works, a Mr William Jollans who was indeed a Methodist local preacher. Thanks for your correction Brian. You'll see I have made that alteration on the blog [ http://johndavies.typepad.com/walking_the_m62/2007/10/grace-under-pre.html ] and also in the updated version of the (B&W edition) of the book. Will get around to updating the colour version soon with that and a few other corrected inaccuracies. My morning spent with you remains a fond and vivid highlight of the journey. Just a little note to say thank you for your book Walking the M62. 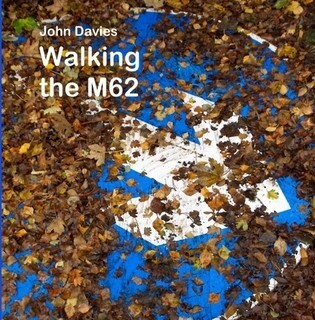 I've written a "bookish observation" blog post at http://artuccino.com/index.php/walking-the-m62-by-john-davies-2/ and at http://artuccino.com/index.php/walking-the-m62-by-john-davies-3/ I've also listed it on my GoodReads list. Thank you for sharing your journey.